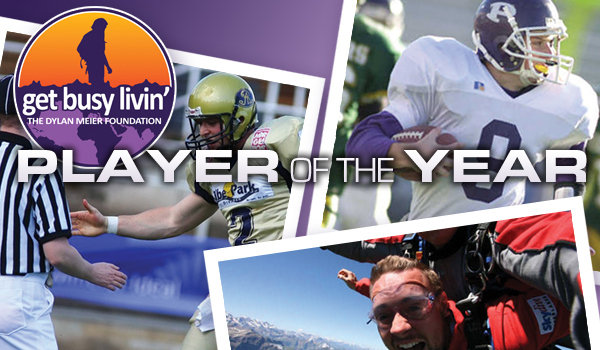 Kpreps.com is proud to announce another strong group of finalists for the fourth annual Get Busy Livin’ – Kpreps Player of the Year Award in conjunction with the Dylan Meier Foundation. The 2014 award finalists include Denzel Goolsby of Bishop Carroll, offensive lineman A.J. Harris of Blue Valley, Evan Morrical from Ell-Saline, Trey Dishon of Horton, Alex Barnes and Sage Mahnken from Pittsburg, Kyle Bollig from St. Thomas Aquinas, and Brett Osbern of Wellsville. The award is in honor of Dylan Meier, a former All-State quarterback at Pittsburg High School and starter at Kansas State University who died in a hiking accident in 2010 at the age of 26. The annual award goes out to one Kansas high school senior who not only has shown excellence on the field but also has demonstrated the values that Dylan embodied and Get Busy Livin’ (GBL) strives to promote: adventure, fitness, curiosity and a daily zest for life experiences. Past award winners include Austin Chambers of Shawnee Mission West in 2013, Brad Strauss of Lawrence in 2012, and Kole Schankie of Madison in 2011. Players from around the state were nominated. The GBL committee then narrowed the list of candidates to eight. The award is made possible by Mytown Media and Kpreps.com. As part of the award, Mytown Media will make a donation of $1,000 on behalf of the winner to the Dylan Meier Get Busy Livin’ Foundation. A two-time Kpreps All-State selection at running back, Barnes rushed for 2,361 yards and 37 touchdowns in 2014 leading the Purple Dragons to the 5A state quarterfinals. For his career, Alex rushed for more than 4,800 yards and more than 60 touchdowns. Barnes was a four-year starter for Pittsburg High and a four-time All-SEK League performer. On defense, Alex moved to safety after playing linebacker his first two years. Last season, he registered 66 tackles, four interceptions, and recovered two fumbles. Barnes graduated from Pittsburg High at semester in order to enroll at Kansas State early. Off the field, Barnes maintained a 3.7 grade-point average at Pittsburg High. He has served as a Dragon mentor and has volunteered for the Special Olympics, the Horn of Plenty community food drive, the Junior Dragons, the Womanless Beauty Pageant fundraiser and a community bed-drive for kids in Pittsburg. "It would be an honor to know that I would be representing all the ideals he stood for. He was a great guy. It would be a tremendous honor." Bollig was a team captain and voted the most inspirational player for the Saints. He rushed for 785 yards and three touchdowns for Aquinas last fall while averaging 5.6 yards per carry from his fullback position. He rushed for 393 yards in the Saints’ first three playoff games last fall in helping Aquinas reach the 5A state title game. Off the field, Bollig is involved in such activities and charities as student council, National Honor Society, Johnson County Youth Leader Summit, Senior Ambassador, Freshmen Orientation Leader, Walk for Life, Gillis House for abused kids, Villa St. Francis nursing home, Special Olympics, Heart to Heart International Relief and Mission Southside Christian. He also is a Kansas Honors Student, earning a 32 on his ACT. “I had a knee injury my junior year of football,” Bollig said. “It hurt really bad, and it wasn't a pleasant experience. It really taught me that you can't take things for granted. One wrong twist could end your football career. If that's all you had, then you'd be miserable afterward. That really taught me to take advantage of all my opportunities and to become a better citizen and a better person in everyday life." Dishon (6-3, 300) is an impressive athlete that earned a late scholarship to Kansas State. He is a 2015 Shrine Bowl selection and a Kpreps All-State selection on the defensive line. He was a four-year starter for the Chargers and a three-time all-league selection. The Chargers finished 7-2 last season and won the Northeast Kansas League title with a 5-0 record. Off the field, Dishon has been involved in Reinvent Horton, Big Brothers Big Sisters, the United Methodist Church and its youth and music groups, student council, local food drives, 4-H, mission trips and coaching youth sports. "I just want to say that I appreciate it all. I can't believe that I made it to the finalists. This is a pretty cool thing. Going to the same school he did, I think this is an awesome opportunity to represent him and for me to try to go about life like he did." When coaches talk about A. J. Harris they often mention phrases like “once in a coaching career” type of player. Harris (6-4, 295) is unbelievably athletic for his size and is a dominant offensive lineman. He is a two-time Kpreps All-State selection and was named to the All-Simone Team and All-Eastern Kansas League first team in each of the past two seasons. He helped the Tigers to the 5A state championship in 2013 and a 6A state quarterfinal finish last fall. Off the field, Harris has been the chairperson for the Della Lamb toy drive, a peer tutor for special needs classes, Challenger youth football and Tiger TV. "This would mean something very special to me, because it would give me the opportunity to carry on his name and know that my actions on the field would represent his. It would be a great honor." A four-year starter at Bishop Carroll, Goolsby helped the Golden Eagles to the 5A state championship last fall. He rushed for 1,641 yards and 31 touchdowns on only 162 carries. Goolsby also caught 16 passes for 251 yards and seven scores. He was equally effective on special teams in returning five punts and a kickoff for touchdowns. He was a Kpreps 5A All-State selection last season at running back and will play collegiately at Kansas State. Off the field, Goolsby remains active in his church and his community. He has volunteered for Catholic Charities working the Lord’s Diner providing meals for the needy and has helped with the Center of Hope to provide groceries to those in need. He has visited children at Levy Special Education Center and with elderly at Via Christi Clinic. He assisted with the Bishop Carroll football camps in helping coach grade school and middle school kids. "First of all, it's an honor to even be in the discussion for the award," Goolsby said. “I'm sitting here and thinking about all the guys in the 2015 class, and it's a talented group of players from the state. And hearing about the impact Dylan had on people's lives. I don't want to be remembered as a good football player as much as I want to be remembered as a good person. I think Dylan kind of embodies that. Having an award like this and letting it serve as a daily reminder would be huge. But even if I don't win, just learning his story is enough for me." Mahnken was a Kpreps 5A All-State selection on the offensive line as a senior in 2014. He helped pave the way for Alex Barnes and helped the Purple Dragons reach the state quarterfinals. Mahnken was a two-time team captain and a first-team All-SEK League selection last fall. He will continue his football career at Pittsburg State. Off the field, Mahnken has been active in Back to School Haircuts, Horn of Plenty, the Get Busy Livin’ 5K, Junior Dragon football camp, middle school football camp, Soles for Souls, Special Olympics, Dragon Mentors, Vacation Bible School, TLC Senior Youth Government and Youth Friends. "I grew up next door to Dylan, and we watched him play at K-State. One thing that stuck out to me was when I was younger, we were having Christmas dinner at my grandparents' house, which was in the same neighborhood. The doorbell rings, and it was Dylan and Kerry. They hung out with us for about four hours in my grandparents' basement playing ping pong and talking. They were playing with my little brothers. I thought it was the coolest thing ever. I think it was right before Kerry was going to play in the Orange Bowl. Dylan was just out of K-State. We thought they were the greatest athletes ever, and they were hanging out with us." Morrical is a two-time Kpreps 2-1A All-State selection on the offensive line. He helped Ell-Saline make an incredible run to the 2-1A state championship game where the Cardinals fell 26-24 to Olpe. Evan is a three-year, two-way starter for the Cardinals and a two-time All-Heart of America League selection. He was selected by the coaches to play in the 2015 Shrine Bowl. Off the field, Morrical was involved in the FFA, career development events, National Honor Society and a variety of community service projects. He also played football despite being diagnosed with a heart condition as an underclassmen. "It would mean a lot to me to carry on the legacy of Dylan and someone who strived to do the best he could and live life to the fullest. Every day is a new day, and I try to attack it. I feel like I'm open to anything. Winning the award would mean the world to me. It would be the biggest milestone for me as far as my athletic career." Osbern was a Kpreps Class 3A All-State selection at running back last fall after rushing for 1,454 yards and 21 touchdowns. Brett helped the Eagles reach the 3A state quarterfinals where they fell 20-14 to Silver Lake in overtime. Osbern was a two-time All-Pioneer League selection at running back and was named to the 2015 Kansas Shrine Bowl. Off the field, Osbern attends the Wellsville Family Worship Center and volunteers at the Lawrence homeless shelter. He is a member of FBLA and has volunteered at nursing homes and in other community service projects. "I'd be real honored if I won the award. I wouldn't take it for granted." Rhett Mizer, RB/LB, Atwood-Rawlins Co.
Dylan Meier, a 2002 graduate of Pittsburg High School, was a two-time All-State quarterback for the Purple Dragons. He continued his football career at Kansas State University and started 11 games from 2004-06 as the Wildcats’ signal caller. On April 19, 2010, Meier died at the age of 26 in an accident while hiking with family in Arkansas. In addition to his time in Kansas, Dylan played professional football in Germany and Italy, served as a bodyguard for Italian fashion models, worked in a vineyard overseas, ran with the bulls in Spain and went skydiving in the Alps. His next plans included coaching football in Europe, teaching English in Korea and possibly a return to Kansas State as a graduate assistant. That zest for life is the basis of the Get Busy Livin’ Foundation that was established in Dylan’s honor. The mission is to provide support for individuals and groups that embody the values that Dylan pursued: adventure, fitness, curiosity, generosity and a daily zest for life experiences. The GBL Foundation is determined to break down the boundaries that keep people from living life to the fullest, whether those boundaries are social, economic or imaginary. GBL uses donations to promote these values in the following ways: student/athletic scholarships, sport camp sponsorships, student travel abroad scholarships, community service needs and other activities that inspire and build character. For more information, please visit http://getbusylivin.org.